The Neggstravaganza has once again returned to the NC Mall for a second year of Negg hunting fun, and it's running alongside this year's Festival of Neggs. 20 Neggs have been hidden for you to find. You are allowed to participate in this event on any of your side accounts. 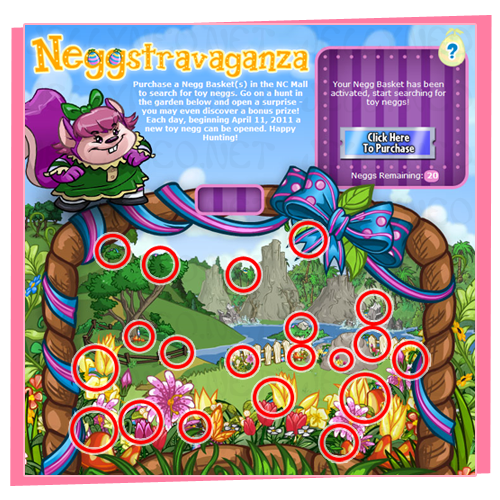 More questions and answers can be found in the Neggstravaganza Surprise FAQ. To start, you'll need to purchase Basket Packs from the NC Mall. They can be found under the "Specialty" or "Spring" link. Packs come in denominations of 1, 5, 10, or 20. These Packs will only be sold until 11:59pm NST on April 30th. Now it's time to apply your Baskets. Go to your inventory, click on the item, and select "Activate Negg Basket" from the drop down menu. Head over to the Neggstravaganza Surprise main page. Hidden in the meadow scene are 20 numbered Neggs. The numbers correspond to a specific release date and prize (see prize list below), so you can choose for which days you would like to claim an item. When you're done with the hunt, it's simply a matter of coming back on the appropriate day, clicking on the Negg in your basket, and seeing what you get. If you forgot to claim your prize on a certain date, don't worry, you have until April 30th to find all the hidden Neggs.